This route has an array of interesting options. Trailhead: To get to the Start/Finish, drive up Mt. Lemmon Highway to just past the 7 mile marker. Turn left into Gordon Hirabayashi Campground (Prison Camp). Drive back to large circular parking area. The trailhead is at the far end. Go up the trail perhaps 100 feet to the Arizona Trail sign, then go left (east). 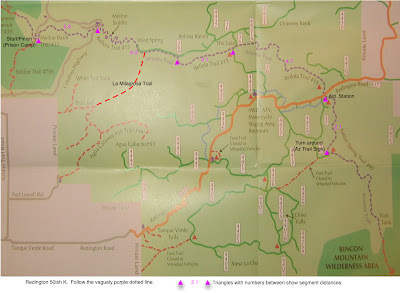 The purple dotted line is the Arizona Trail. Green lines are jeep roads. 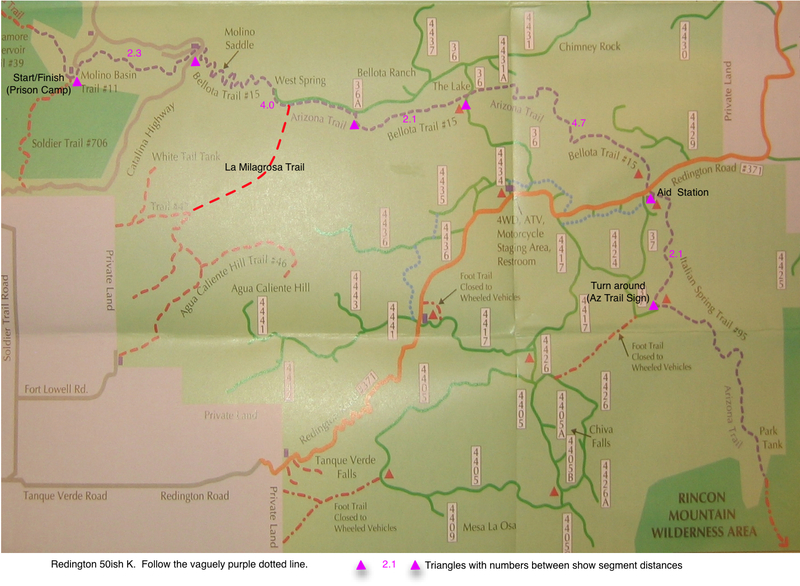 The original map has been modified to add the route features and the unmarked La Milagrosa Trail. The route starts in the upper left corner where there’s a little square and the legend “Molino Basin Trail #11″. Follow the Arizona Trail to the Az Trail as shown on the map. The segments have several local names, all shown. During the scheduled run, we have an aid station set up where the route crosses the orange line of Redington Pass Road. That’s very close to the half-marathon distance (13.1). Continuing on the Italian Springs Trail to the Arizona Trail sign gets one very close to 25 kilometers/15.5 miles (actually 15.7 miles according to the Arizona Trail web site). Start to Mt. Lemmon Highway: 2.3 mi. Highway to where Bellota Tr leaves jeep road (under 36A) 4 mi. Bellota Tr to Bellota Rd crossing 2.1 mi. Bellota Rd crossing to Redington Rd. 4.7 mi. This is the Italian Springs trail head, where we put an aid station.